Android's Platform Distribution chart has been updated for August, and this month brings little in the way of interesting change. Marshmallow has risen around 1.9 points, to 15.2% of installs, with Lollipop 5.0 and 5.1 actually netting a 0.4 point gain this time around. Last month, total Lollipop installs actually dropped around 0.3 points, meaning this month's increased numbers have actually reversed that change and then some. Given that 5.0 installs didn't actually grow - gains were made solely by v5.1 - it's not exactly clear what happened there. Perhaps a large number of devices have gone straight from KitKat to Android 5.1, though that's an awful strange time for a jump. 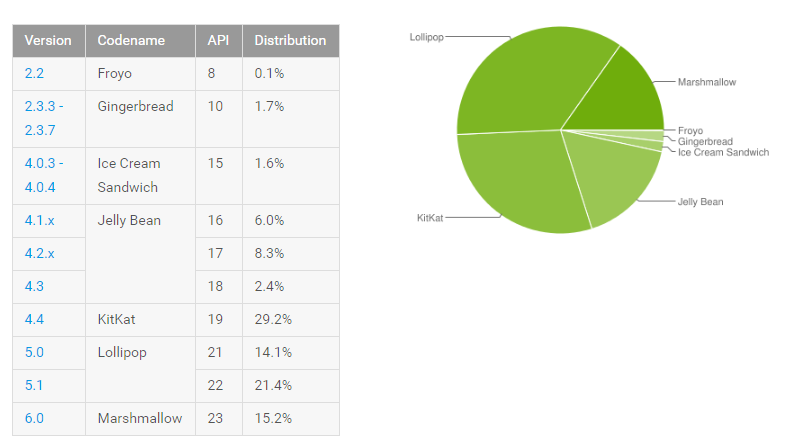 Anyway, the overall numbers otherwise shifted in predictable ways: Gingerbread, ICS, Jelly Bean, and KitKat continue to dwindle. Compared to last month's 3.2 point boost for Marshmallow installs, August's 1.9 point increase is a bit more modest. Looks like Marshmallow broke 15% just in time for Android 7.0 to launch! Froyo stubbornly clings on at 0.1%, as always.